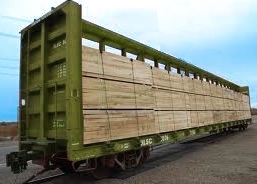 Flexpak manufactures Railcar Covers for lumber, wood, siding, and composite products. Railcar Covers are manufactured with woven plastic materials for maximum protection when shipping products by rail. The standard size for Railcar Covers is 76’ x 32’, however, Flexpak can customize Railcar Cover sizing for the needs of the customer. The standard weave allows for a tear and wear resistant cover; the weave is then coated front and back with a Low Density Polyethylene, creating a water resistant material. All Railcar Packaging have UVI additives, protecting the cover’s integrity and the underlying products from sun damage. 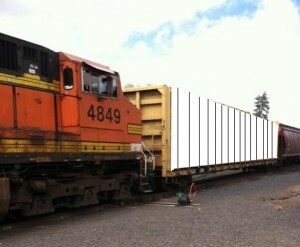 Why choose a Railcar Cover? Choosing a Railcar Cover for shipping goods is a cost-effective means of protecting goods on a rail line from dirt, grime, weather, and the conditions encountered in the shipping process. 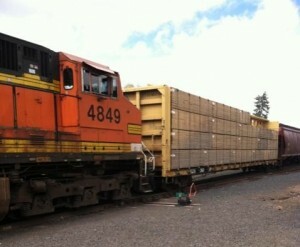 Most in the industry have witnessed the dust and dirt build-up on lumber when shipped by rail uncovered. Railcar covers provide a protective shield from this build-up, allowing products to arrive at their destination as if they just left the mill. The ability to advertise is just as important. 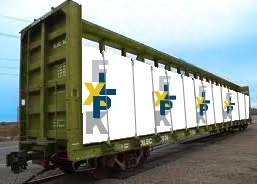 Flexpak believes that Railcar Covers provide the opportunity for customers to communicate with consumers regarding the product being shipped and the associated corporate image. With the United States holding the most extensive rail line in the world, often paralleling major interstates, a Railcar Cover with an effective print can influence the consumer before the product even arrives to the supplier. See the Printed Railcar Cover page for more information. Contact Flexpak at any point to discuss Railcar Packaging when shipping by rail.